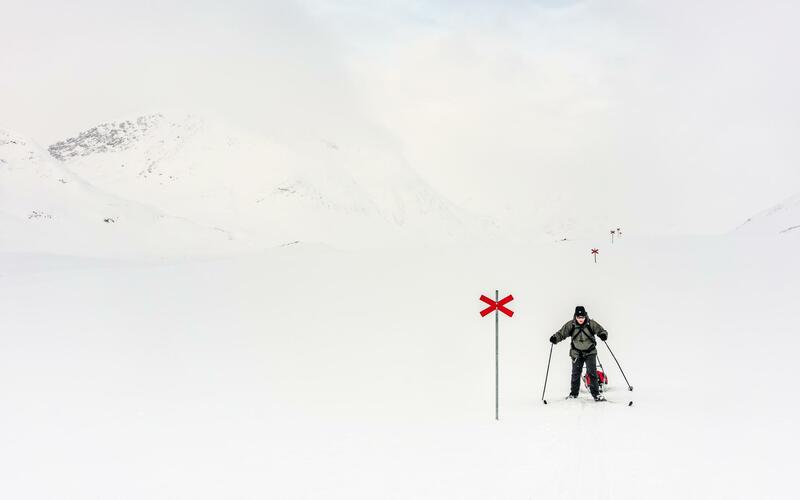 I am no stranger to photographing on skis, having combined my love of Nordic skiing with photography on many previous holidays. Until this trip, however, outings on skis were limited to day trips only and usually at a time of year when the days were quite long and I could take my time, stopping for photography as often as my long suffering husband, Rob, could bear! 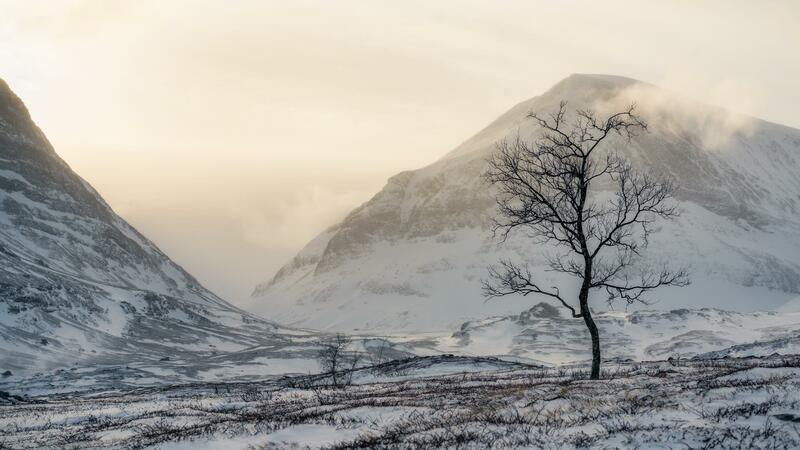 Last March we toured part of the famous Kungsleden or King's Trail in Arctic Sweden – something we’d wanted to do for many years. You can do it as part of an organised group but we opted to go alone, confidence gained from having skied a little bit of the well-marked trail on a previous visit to the area. Our route would take us over around 100km of mixed terrain, from Abisko to Kebnekaise, staying at mountain huts each night. 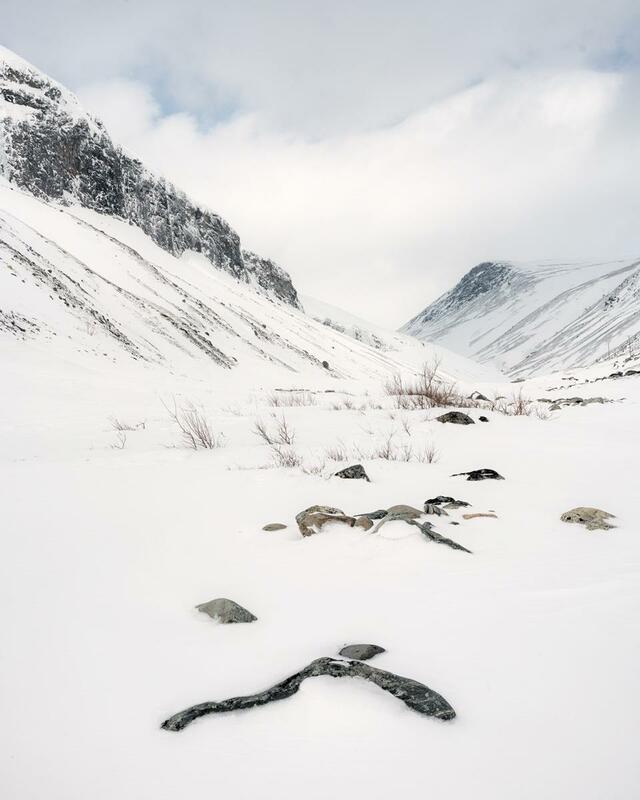 The route is well marked but travels through some very remote mountainous scenery; the weather can be brutal and there is no mobile phone signal and no electricity nor running water at any of the huts. First and foremost, we had to ensure we were properly equipped with the right gear to be safe, travelling in such an environment. Equally, I was very keen to make sure I was in a position to take advantage of what I knew could be spectacular scenery and so wanted to have a reasonable amount of camera gear with me. 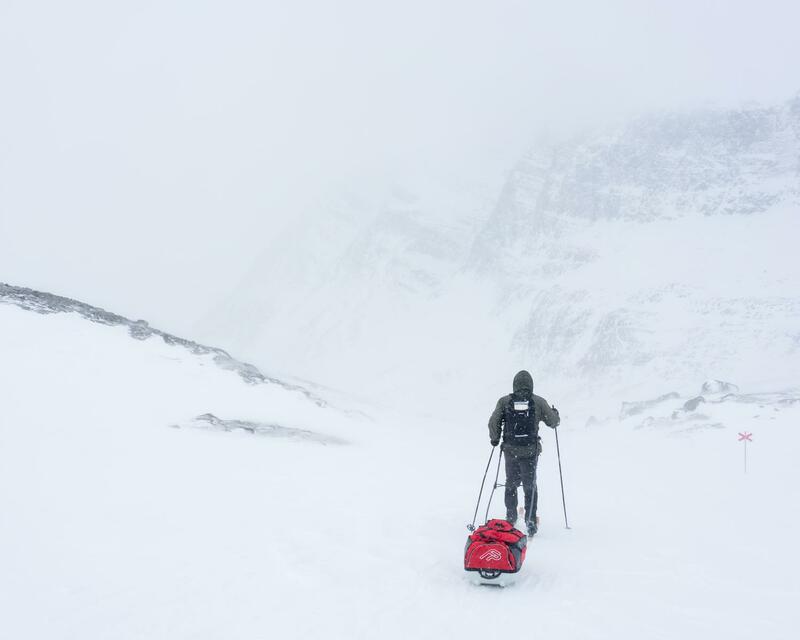 Rob gallantly agreed to drag our sleeping bags, clothes, food (freeze dried), drink, and emergency gear in a ski pulk – we purchased one designed specifically for these kind of trips. I bought myself an Osprey Kamber 32L backpack, designed for back-country skiing, but perfect for photography because of its back panel opening. I found a suitable camera insert to put inside it and that still left room for various provisions, jacket, and so on. The side straps intended for skis, were perfect for my travel tripod. I took my Sony A7rii, with the A6000 as back up, then a Zeiss Loxia 21mm and 35mm lenses, Sony 50mm macro and the 70-300mm zoom. 6 spare batteries and a few accessories completed the kit. Total weight of the pack, including other gear, was a little under 10kg so really not bad at all. We started our trip on 7th March. 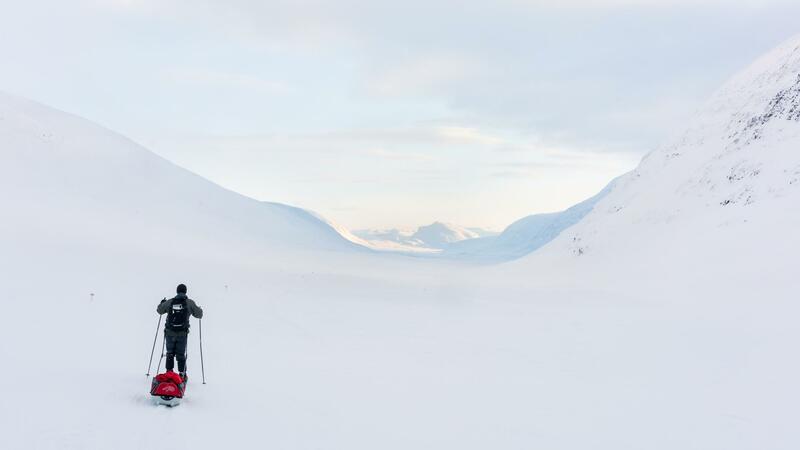 The first leg of the trip is quite short – only about 15km – so we felt comfortable leaving Abisko in the early afternoon, with friend and fellow photographer Oliver Wright (and Nivi) accompanying us for the first few kilometres. We arrived at the huts at Abiskojaure just after sunset (around 5.15pm at this time of year). It was a beautiful sunny day, cold, clear and lovely conditions in which to ski, if not the best for photography. 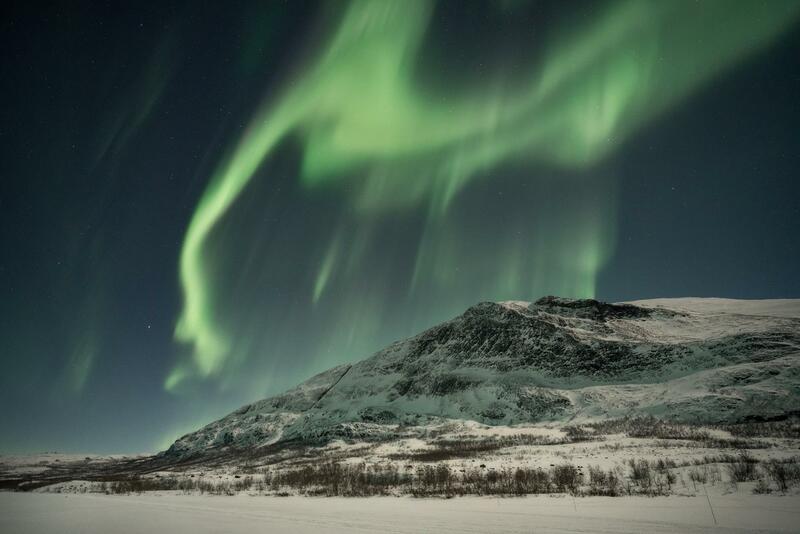 Come darkness, however, it was the perfect conditions in which to see and photograph the Northern Lights and we were blessed with a really fantastic display. The aurora was moving so fast, I found myself having to raise ISO to 6400 to achieve shutter speeds of little over 1 second. It was around -20 outside but, being quite still and dry, it was very manageable and the Sony performed flawlessly in these cold conditions. Tripod and ballhead joints were stiff to operate, but certainly up to the job! The weather had closed in somewhat the next morning but, to start with, conditions were quite pleasant. We were warned to expect some long and arduous uphill sections – and so it proved. In fact the whole day was a real slog – very hard to get good grip on the worn snow with our waxed skis and we ended walking up many of the steeper sections – Rob pulling the pulk, me pushing from behind! Luckily the snow was mostly fairly compressed and hard in such cold conditions, so walking was not as difficult as it might be. The scenery was clearly very beautiful but the light was flat and the visibility increasingly poor so, although I’d been told to expect some fabulous views on this leg of the trip, I didn’t get the camera out as much as I’d anticipated. This was also down to the fact that it was really tough day and we needed to conserve energy to ensure we completed the 20km journey before darkness fell. 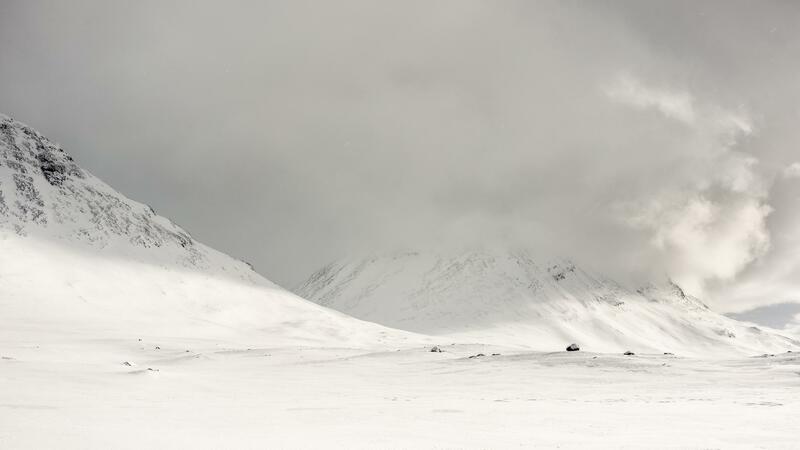 I really started to appreciate the work and commitment of photographers who document extreme expeditions. 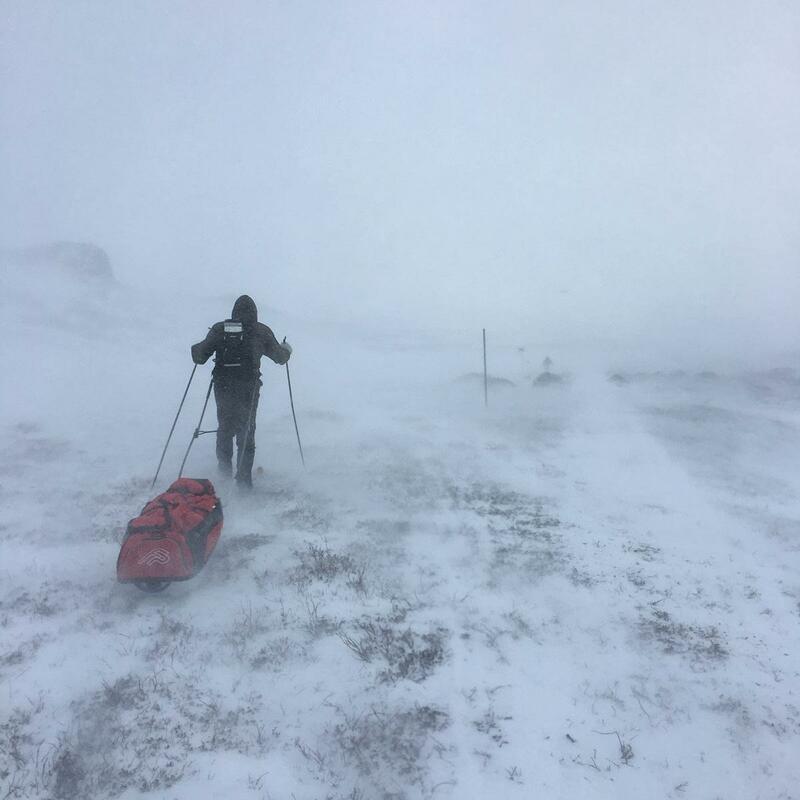 With only a few kilometres to go, a blizzard started and visibility vanished. We had left the official trail to take the more direct route over a very long, frozen lake, so there were no way markers. Rob had taken a compass bearing earlier, when we could still see our destination and this, together with the detailed map on my Viewranger iphone app, reassured us that we were going in roughly the right direction. 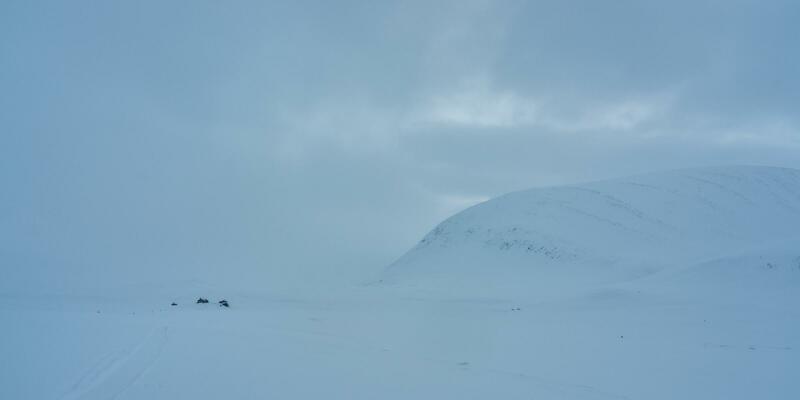 It was a little hairy, however, with no protection from the elements, so we were very relieved when things cleared up slightly and at last we could see the huts of Alesjaure, not too far ahead. You can see them on the right hand side in the photograph below. We arrived feeling utterly exhausted. However, you can’t just rest – we had to go and get fresh water from an ice hole, situated far below the huts, chip away at the ice so the bucket would fit, then drag it back up the steep slope. Thankfully someone else in the hut had chopped enough wood for the night so we were spared that task. Freeze dried chilli con carne has never tasted so good! We had a room to ourselves that night, with the hut being fairly empty and got a really good night’s sleep. We awoke to a beautiful dawn, clear and cold, with just a hint of colour. Feeling much revived, I dashed outside to capture a stitched pano of the view and the start of our route for the day. Conditions could not have been more different from the previous day. The snow was perfect, the weather delightful and it was a joy to ski. The next hut was only 13 kms away but, so long as we got there by around lunchtime, we’d decided we would try and make it to the better-equipped Sälka hut, a further 12 km beyond. With such a beautiful landscape in every direction, there was a temptation to stop and photograph every few minutes. I tried to ration myself and we did indeed make it to the first hut in time for our picnic lunch. A short rest and then a long climb up to the Tjäktja Pass. Far easier than the climbs the previous day, though, with the fresh, cold snow offering much better grip for our skis. The view from the top was simply breath-taking – I could have stayed there all day and would love to have got really carried away with the camera. However, we could see that the weather was once again closing in behind us; with 8km still to go and only a couple of hours daylight remaining, this was not the time to indulge. The first section of descent was extremely steep and, as Rob discovered, not readily negotiable with pulk in tow. After a bit of a wipeout, we opted to walk the first section, this time in very deep snow, so it was slow going. Thereafter we had a lovely downhill trundle on a gentler gradient. If only it has been like that all the way! Soon after, we found ourselves negotiating lots of little hills, heavy going and both of us feeling very tired after such a long couple of days. Again it was reassuring to be able to track our progress on the Viewranger app, particularly as we knew the huts would not come into sight until the very last minute. Finally, at around 6pm, darkness setting in, we caught the very welcome sight of the huts, just emerging from the gloom and low cloud ahead. I’d not taken my camera out since we’d been on top of the pass but, now reassured we’d made it, out came the tripod and camera to capture the rather beautiful and eerie scene ahead. Later that evening, the clouds partially lifted and the surrounding mountains were beautifully lit by the moonlight. I spent a while outside, again in very low temperatures, taking some long exposures. 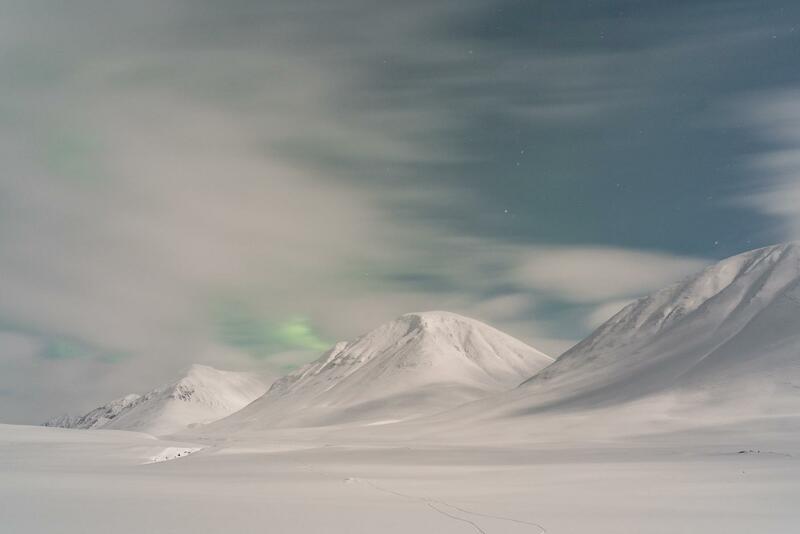 Although invisible to the human eye, the aurora was again in evidence and I loved the subtle tinge of green peeping out from behind the scudding clouds during a 30 second exposure. We were back to sharing rooms and saunas for this night's stay - not ideal but not unexpected! What I hadn't anticipated was quite such a long walk to the outside loos - a veritable marathon on a freezing cold night in the arctic! 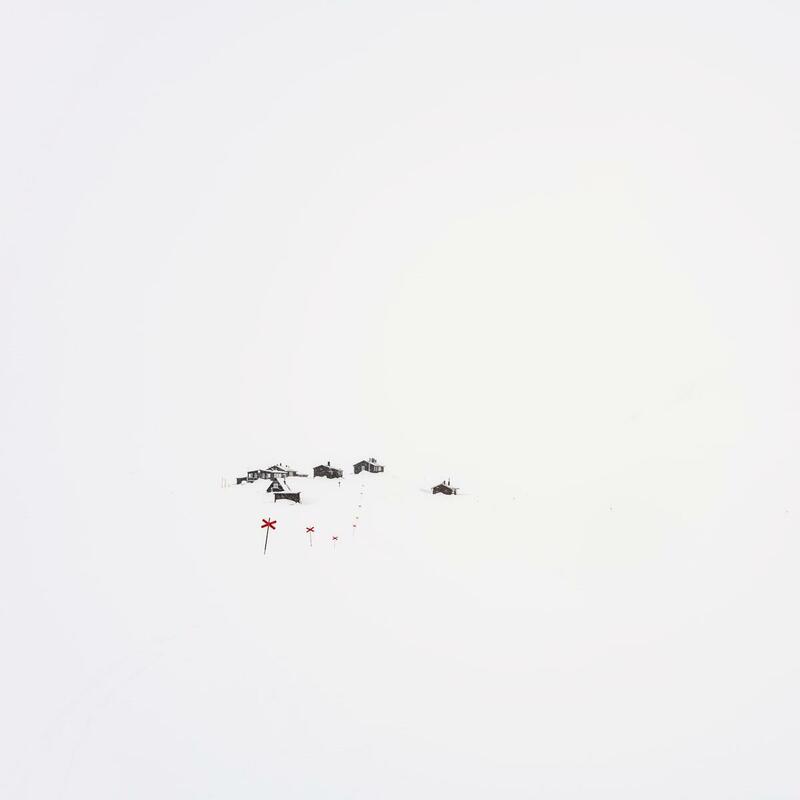 A new day dawned with a wonderfully minimalistic whiteout enveloping us. 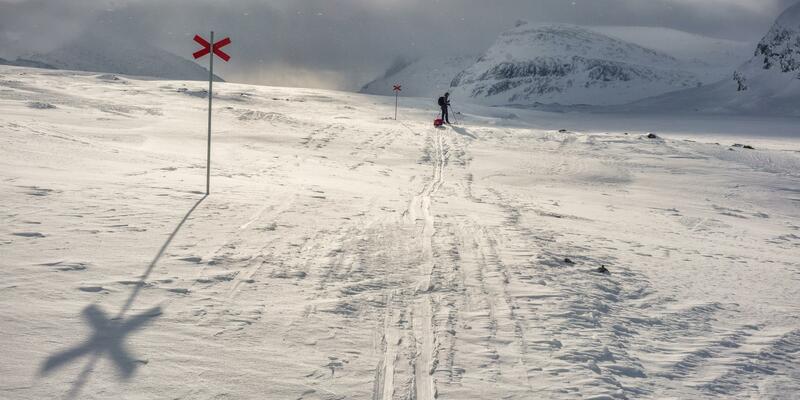 Today we had the luxury of a very easy 12km ski to Singi hut. As luck would have it, a leisurely day coincided with the best photographic conditions of the trip, with what turned out to be fabulously changeable weather. It was so good to be able to stop and take photographs whenever I pleased, no panic about reaching our next destination in daylight hours. Not a day to be up high on the passes, though, so the long day previously was totally vindicated! Today would have been unpleasant up there, and we’d have missed those amazing views down into the valley. We were again treated to a room to ourselves at Singi and, although we had to chop and saw wood for the fire, water was provided – luxury! And so on to our last day on the trail – a simple 14km to Kebnekaise, with a short uphill section to start. The Singi warden told us there was a bit of weather about but nothing that should be too troublesome. Conditions were very atmospheric – moody and with mixed visibility. Knowing we had plenty of time, we stopped for photos as and when suited, occasionally crossing paths with two other groups on the trail. At times we were convinced the weather was about to clear and the sun would break through. I wondered about hanging around for a while to see if we’d get some interesting light but, each time I considered it, the gap in the clouds vanished again. The ferocity of the storm took us by surprise. 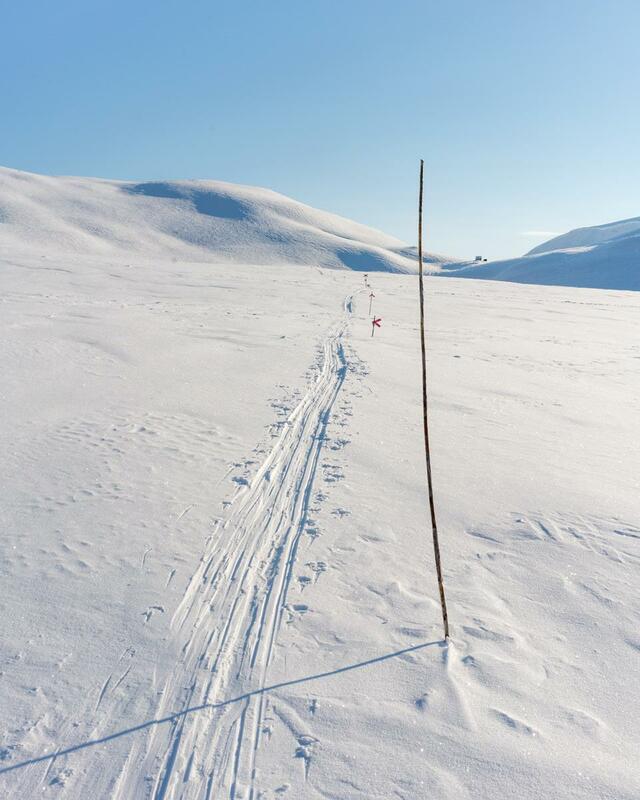 We’d been skiing on the flat for a while, with a reasonably strong tail wind, which had the advantage of pushing me along at a gentle pace, very little effort required. Not so for Rob, who was weighed down somewhat by the pulk. 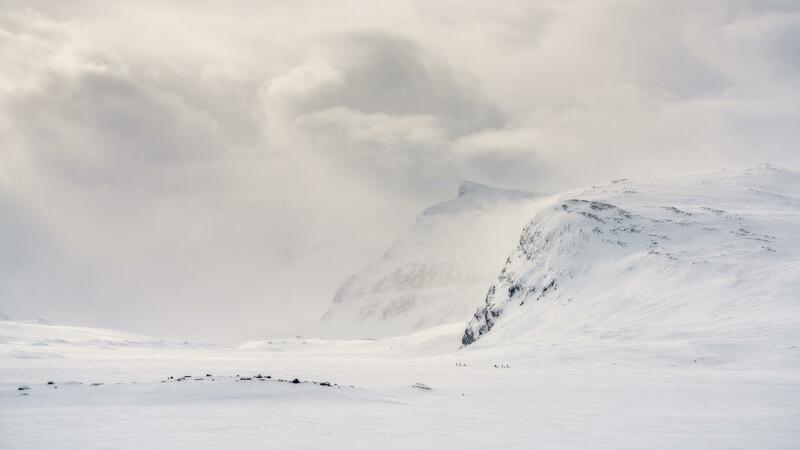 However, not long after, the tail wind transformed itself into a howling gale, with storm force winds hurtling me forwards across patchy snow, rock and ice. It was pretty terrifying but I was just able to use my ski sticks as a brake/support combination and stay upright and in one piece. Rob’s heavy pulk was now a big advantage, acting as a giant brake and helping to keep him grounded. There’s no doubt that those last few kilometres made for the most unpleasant experience on a pair of skis that I can recall. When we did finally reach Kebnekaise mountain station, the relief was immense – we had made it in one piece and could look back with some pride at coming through an exhilarating and terrifying experience. In most respects our timing was spot on and we’d been very lucky with the weather. I’d loved to have taken some proper action shots of the storm but there was no way I was going to risk injury to myself or my camera by trying to get it out of my backpack. I did, however, manage one little shot on the iphone. 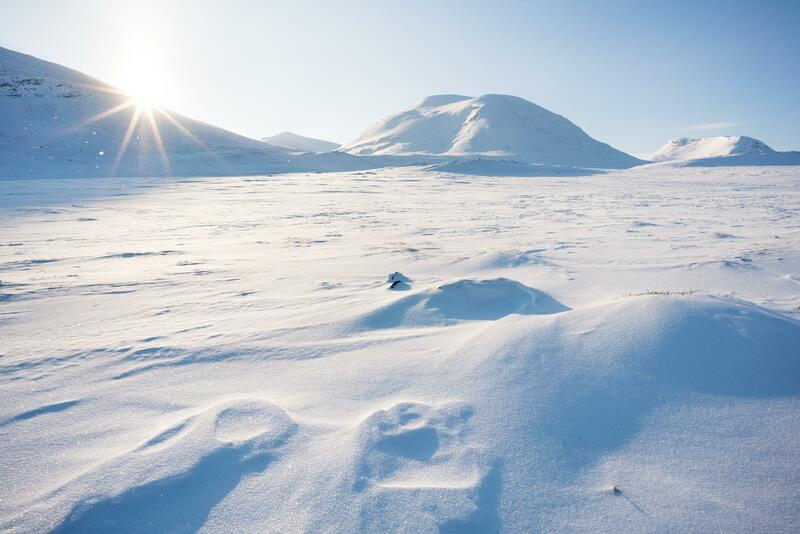 Again, I felt huge respect for those that manage to film and photograph expeditions in these kind of conditions. We enjoyed a couple of nights at Kebnekaise, relishing the privacy of a twin room and some fabulous cooked meals. It’s a really beautiful area an I was again able to enjoy some proper time with the camera on our full day there. 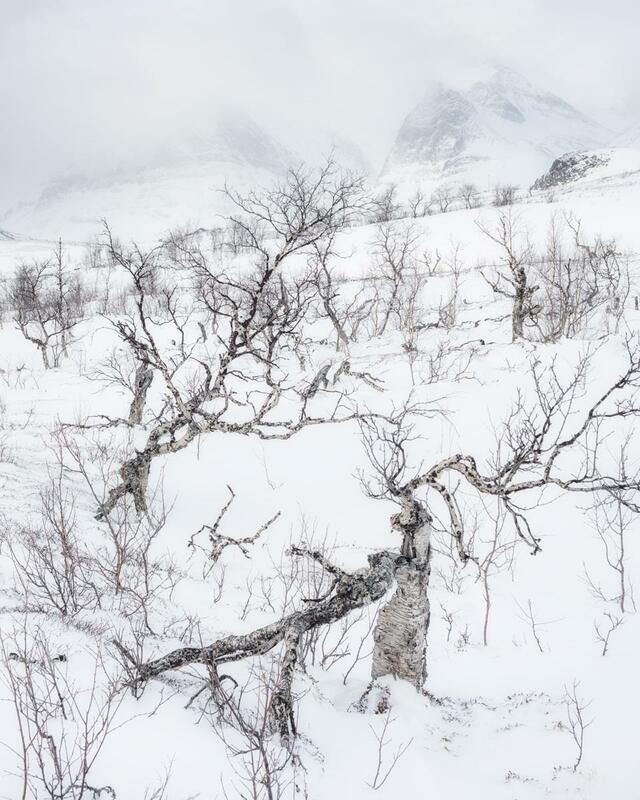 I was a bit fed up with carrying my tripod so limited myself to hand held photography – always a challenge on skinny Nordic skis but, being lower down, we had plenty of twisty Arctic birches to enjoy as well as a stunning mountainous backdrop. 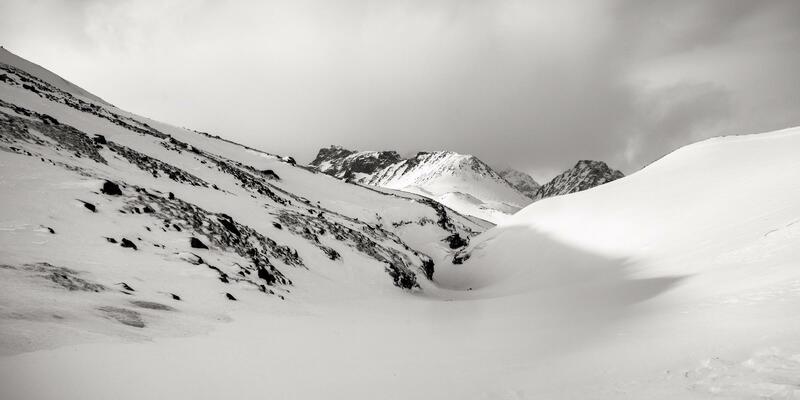 We had a lovely little ski up the lower reaches of the Tarfala Valley - I'd love to go further up another time - it is said to be stunning. All in all, we’d had an amazing trip, been very lucky with the weather and I managed to come home with a pretty good selection of photographs. 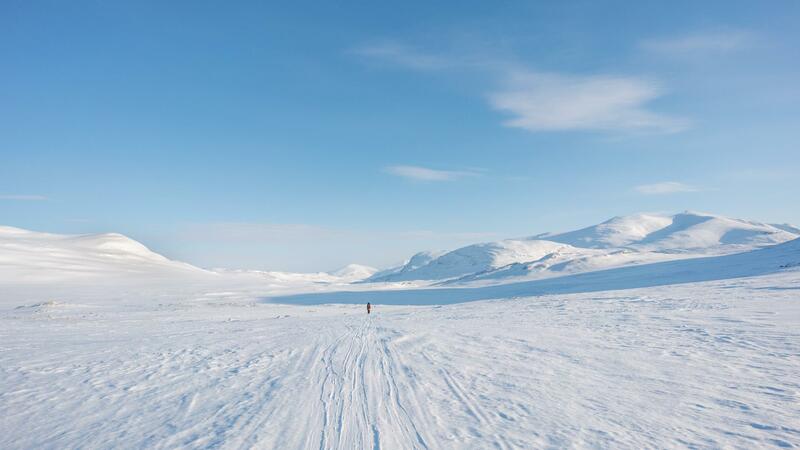 All that remained was a gentle 20km ski down to Nikkaluokta on our final day, before taking a bus back to Kiruna. I think we’ll be back! This article was first pulished in the August 2017 edition of Landscape Photography Magazine. The vast majority of the photographs were taken with a Sony A7Rii and Zeiss Loxia 35mm lens, including several hand-held stitched panoramas.